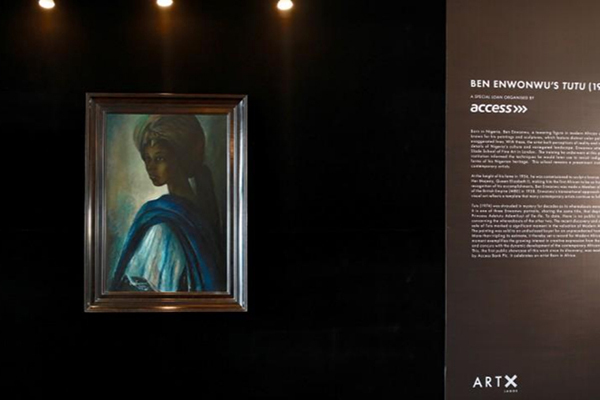 The Nigerian Mona Lisa, a painting lost for more than 40 years and found in a London flat in February, is being exhibited in Nigeria for the first time since it disappeared. "Tutu", an art work by Nigeria's best-known modern artist, Ben Enwonwu, was painted in 1974. It appeared at an art show in Lagos the following year, but its whereabouts after that were unknown, until it re-surfaced in north London. The owners - who wished to remain anonymous - had called in Giles Peppiatt, an expert in modern and contemporary African art at the London auction house Bonhams, to identify their painting. He recognized Enwonwu's portrait. "It was discovered by myself on a pretty routine valuation call to look at a work by Ben Enwonwu," said Giles Peppiatt, director of contemporary African art at Bonhams. "I didn't know what I was going to see. I turned up, and it was this amazing painting. We'd had no inkling 'Tutu' was there. How it got there remains a bit of a mystery, " Peppiatt said. "All the family that owned it know is that it was owned by their father, who had business interests in Nigeria. He traveled and picked it up in the late or mid-70s." The family put the portrait up for sale, and it was auctioned for 1.2 million pounds (1.57 million US dollars) in February to an anonymous buyer. 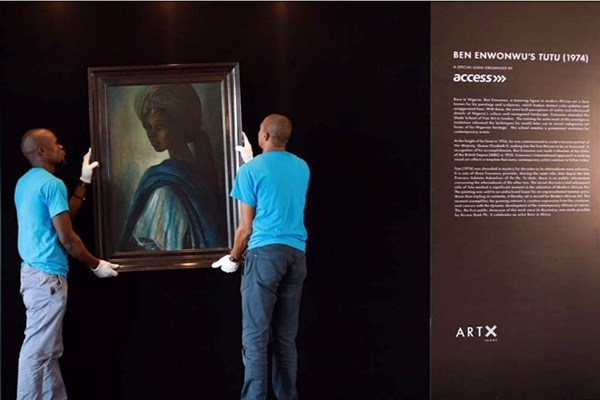 The sale made it the highest-valued work of Nigerian modern art sold at auction. "Tutu" was loaned to the Art X Lagos fair, held from Friday to Sunday, by Access Bank, the organizers said in a statement. Peppiatt said Access arranged the loan but is not the painting's owner. "'Tutu' is referred to as the African 'Mona Lisa' by virtue of this disappearance and re-emergence, and it is the first work of a modern Nigerian artist to sell for over a million pounds," said Tokini Peterside, the art fair's founder. The original Mona Lisa, Leonardo da Vinci's masterpiece, was stolen from the Louvre in 1911. The thief, Vincenzo Peruggia, eventually took it to Italy, where it was recovered and in 1914 returned to the Louvre.